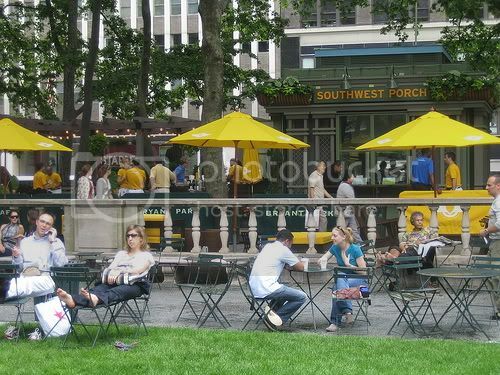 To celebrate yesterday's launch of its' new service to La Guardia, Southwest Airlines has teamed up with 'Witchcraft to provide Bryant Park visitors with a pop-up patio. We popped over and checked it out. Aside from having a drink served by adjacent sandwich shop 'witchcraft, visitors can ask questions, learn about Southwest's new routes and even book tickets. Partnerships with the city and 'witchcraft were negotiated on Southwest's behalf by NYC-based Civic Entertainment Group, whose other clients include the History Channel, MBNA and A&E Networks. Bryant Park has over 4.2 million visitors, the majority of which commute, tan, drink or take in outdoor movies during the summertime. This is a creative example of two peer brands teaming up to impact influencers in a unique, high traffic setting.